Also serving communities of New Oxford, Littlestown, Gettysburg, New Freedom. There are 7 Assisted Living Facilities in the Hanover area, with 5 in Hanover and 2 nearby. To help you with your search, browse the 21 reviews below for assisted living facilities in Hanover. On average, consumers rate assisted living in Hanover 4.5 out of 5 stars. Better rated regions include Sykesville with an average rating of 4.6 out of 5 stars. Caring.com has helped thousands of families find high-quality senior care. To speak with one of our Family Advisors about assisted living options and costs in Hanover, call (855) 863-8283. Dubbed the “Snack Food Capital of the World,” the city of Hanover, Pennsylvania, is home to multiple snack manufacturers like Snyder’s of Hanover and Wolfgang Candy. Seniors who enjoy snacking will find Hanover’s stores filled with local treats. Hanover is also home to a significant senior demographic; individuals ages 65 and older make up nearly 20 percent of the overall population. With five assisted living facilities in town and another 32 in close proximity, seniors will have a fine selection to choose from. These facilities are regulated by the Pennsylvania Department of Human Services and are equipped to assist residents with activities associated with daily living. Some may even provide additional support to seniors with medical conditions. Hanover offers plenty of cultural attractions for seniors to enjoy. These include Neas House Museum and Eichelberger Performing Arts Center. Many of the area’s assisted living facilities offer supervised trips to these locations, and various other regional attractions of York County. Hanover is home to world-class medical facilities, including Hanover Hospital: UPMC Pinnacle, in the event of medical emergencies or illness. With a cost of living index four points lower than the national average, Hanover seniors may find that they retain more money in their budgets. The State of Pennsylvania does not tax seniors’ withdrawals from 401(k) accounts, retirement accounts, or Social Security checks, which will also afford seniors with a cost savings. Rabbittransit provides public bus service for Hanover as well as other destinations in York County. Riders aged 65 and older ride Rabbittransit buses for free. Weather in Hanover could make it difficult for seniors to easily traverse the city. The January average low is 21 degrees, and the city frequently experiences heavy snowfalls and icy conditions. Seniors with respiratory conditions should also note that summers in Hanover can be hot and humid, with a July average temperature of 88 degrees. Assisted Living costs in Hanover start around $0 per month on average, while the nationwide average cost of assisted living is $4,000 per month, according to the latest figures from Genworth’s Cost of Care Survey. It’s important to note that assisted living rates in Hanover and the surrounding suburbs can vary widely based on factors such as location, the level of care needed, apartment size and the types of amenities offered at each community. 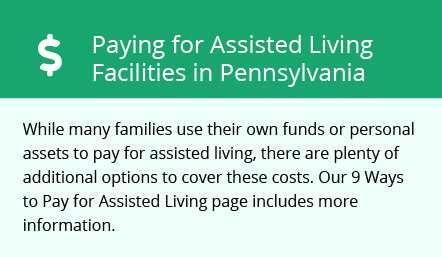 There are no financial aid waivers offered by the State of Pennsylvania to help pay for care at an assisted living facility. Currently, existing waivers only help pay for nursing home care or home services for seniors who choose to age in place. However, seniors who receive SSI may qualify for the state to pay a supplement for their care at an assisted living facility. To see a list of free assisted living resources in Hanover, please visit our Assisted Living in Pennsylvania page. Hanover-area assisted living communities must adhere to the comprehensive set of state laws and regulations that all assisted living communities in Pennsylvania are required to follow. Visit our Assisted Living in Pennsylvania page for more information about these laws.